By far the most popular form of fresh water fishing in England is coarse fishing and there are some amazing locations from city centres to remote countryside, canals, rivers, lakes dredged out in the 70's for gravel to feed the motorway build programme, now proving picturesque settings to go fishing, with amazing fish. There are ancient waterways, industrial revolution canals, rivers rehabilitated after year of pollution and of course waters that have always excelled like the Test, Avon Kennet. 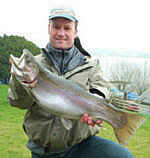 There are so many day ticket opportunities or clubs open to members offering fantastic fishing. Don't assume clubs all have poor water, you will find clubs with 40lb carp, mid teens bream, roach tipping at record , monster tench and scarey pike. Memebership is generally very affordable and they lead the way in providing for disabled access and support for beginners and youngsters. As to game fishing England has some superb fishing venues, not just on the world renowned chalk streams of Hampshire but throughout the length of the country. Sadly salmon fishing in the south and south west of England has taken a hammering from the Irish drift nets in the last few decades but with the nets no longer operating the once great salmon rivers; Wye, Test, Itchen and Avon and many more should see a recovery over time while the revived Tyne and Wear are showing some Scottish rivers how it is done. Trout fishing in England went from strength to strength as more and more large lakes were opened in the 20th century, Keilder being the biggest and latest addition, some of which, Chew, Blagdon, (yes its the oldest trout fishery in Britain if you discount Loch Leven), Rutland, Bewl and so on offer the best angling you can hope for just about anywhere. I hopeSpinfish Where to Fish directory will guide you to some great days fishing. Please remember that you must have a rod license to fish in England and Wales and on the Border Esk in Scotland which is designated an English River. The exception is the Tweed system where some rivers in Northumberland are covered by the Scottish regulations (e.g. no Sunday fishing for migratory fish)for the Tweed river system and no rod license is required. Please check when fishing in the area that the water you are fishing is connected to the Tweed for the exemtion to apply.